Background: Co-existing of odontoid subluxation syringomyelia and vertebral artery abnormalities is a rare condition occurred in spinal cord, and the therapeutic approach of this disease is also rarely reported. Hence, a case of co-existing of odontoid subluxation syringomyelia and vertebral artery abnormalities was reported in this study. Methods: A male patient, who suffered with limited head and neck functions, was described in the current study. X-ray and MRI examinations for cervical vertebra were performed to examine the conduct physical examination. Meanwhile, the basic personnel characteristics were also collected, including speech, behavior, power, and state of mind. After examinations, patient was received surgery treatment with a prone position, and the outcomes were checked using CT imaging. Results: According to patient’s narration, he had suffered from inability and pain in left lower limb accompanied with limited locomotive for more than 4 months. Further physical examinations showed that patient had a sober mind and powerful shrug, but obvious hoarse voice and blear speech, soft neck, and limited limb activity. Meanwhile, X-ray and MRI results showed obvious occipito-cervical deformity, odontoid subluxation and syringomyelia. During surgery, an obvious insertion and merge of lepospondylous arcus posterior was found in foramen magnum posterior, and no sever events had been observed. The patient recovered gradually after surgery, however long term outcomes of the treatment needed more clinical data of follow-up. Conclusion: Limited neck and limbs activity were the main syndromes of the co-existing of odontoid subluxation syrignomyelia and vertebral artery abnormalities, and bleeding may be an important risk factor and should be significantly considered during surgery treatment. Odontoid subluxation, Syringomyelia, Vertebral artery abnormalities, Spine disease, Surgery. Syrignomyelia is a common atlanto-occipital malformation disease in clinic , but the co-existing of odontoid subluxation syrignomyelia and vertebral artery abnormalities is still rarely reported. With the deformity of vertebral artery, the risks during surgery therapy will be significantly increased. In the current study, we have reported a case of patient suffered with the co-existing of odontoid subluxation syrignomyelia and vertebral artery abnormalities. Meanwhile, the surgical method used for this disease was also provided. A 33-aged male patients, who had a limited head and neck functions within 33 years came to our clinical search therapy for inability and pain in left lower limb accompanied with limited locomotive for more than 4 months. As his narration, no fever, sensory disturbance, and gatism ever happened since these syndromes occurred. 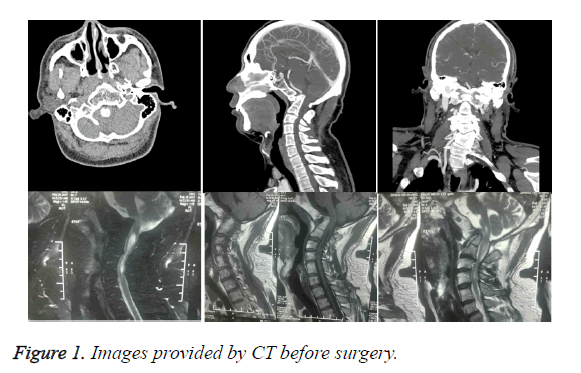 Before this attendance, he also received X-ray and MRI examinations for cervical vertebra in the Second Hospital of Shijiazhuang, Hebei, China, and found occipito-cervical deformity, odontoid subluxation and syringomyelia. To receive a further therapy, additional examinations were also performed in our hospital. The examination results showed that although he had a sober mind and powerful shrug, obvious hoarse voice, blear speech, and soft neck were also identified. For the upper limbs, big and small thenar muscles of both hands were obviously atrophy, and musculus biceps and triceps brachii of two flanks were markedly hyperreflexia. For the lower limbs, knee jerks of both flanks were also hyperreflexia, and ankles clonus, Hoffman and Babinski signs were positive. Meanwhile, hypermyotonia and V stage muscle force were identified in all four limbs along with unstable tread. Moreover, according to X-ray and MRI examinations, obviously developmental malformation in craniocervical, syncretic atlanto-occipital odontoid subluxation and syringomyelia were identified in the head and neck spines of this patient (Figure 1). Figure 1. Images provided by CT before surgery. For treatment, patients were given general anesthesia and prepared for surgery treatment with a prone position. With alcohol disinfects, a 10 cm incision was performed with a posterior approach at neck, and a traction with 16 kg was made. 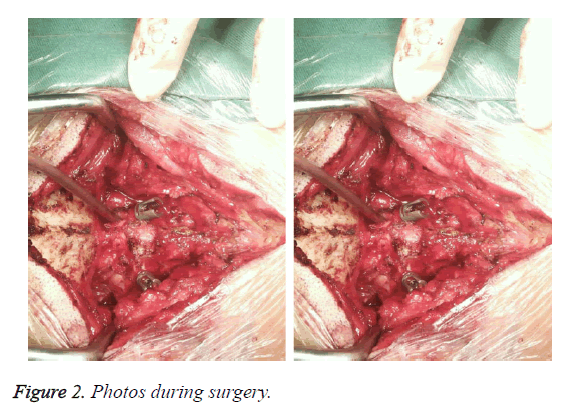 For this incision, skin was cut apart, and spinous process was first uncovered. Followed by this, the muscle around spinous process was apart, and vertebra, inion and occipital bone were exposed. Single hook was used to strut muscle. Then, an obvious insertion and merge of lepospondylous arcus posterior in foramen magnum posterior was found, and after open lepospondylous arcus posterior about 3 cm, remarkable merge was identified in 2nd and 3rd neck spinous process. Meanwhile, both flank zygopophyses were carefully to dissect and expose with 1st~2nd joints. For the right side, an obvious abnormal was identified in the zygopophysis between 1st~2nd joints, and a malformation was also identified in vertebral artery in the right side. For the left side, the other was not revealed. The 1st and 2nd joints were fully debonding using rimer via foramen magnum pathway. Based on these results, a suitable height cage was selected. After filled up with right ilium, cages were placed between 1st and 2nd of both flank joints (Figure 2). Moreover, at the bone ridge under inion, 2 occipital nails were used to fix the occipital plate. In addition, pedicle screw was inserted at the both flank vertebral arch, and pitman was bent and fixed. Finally, hemostasis and sutured layer by layer were performed. The surgery outcomes were shown by CT images (Figure 3). The patient recovered gradually after surgery, however long term outcomes of the treatment needed more clinical data of follow-up. Figure 2. Photos during surgery. Figure 3. Images provided by CT and MRI after surgery. Syringomyelia is a common neurological disease in the spinal cord, and usually associated with conditions of spinal cord injury, spinal tumor and Chiari I malformation . Specially, there are about 50~76 % of syringomyelia occurred along with Chiari I malformation . However, the co-existing of odontoid subluxation syrignomyelia and vertebral artery abnormalities is still rarely reported. Although surgery is still the first choice of syringomyelia treatment, the surgery outcomes are still not satisfied till now. For the co-existing of vertebral artery malformation, the bleeding during surgery also makes it difficult in the treatment. Atlanto-occipital odontoid subluxation is an infrequent atlantoaxial subluxation in clinic, which is a serious condition that can result in sudden death owing to cervical cord compression . Parke et al. have demonstrated that the upper cervical spine might be affected by the congestion of effusion from the lymph and veins in the posterior pharynges . For the odontoid subluxation, the odontoid will be significant retro-position and result in an increased suppression in the veutro of brainstem [6,7]. Meanwhile, this injury in spine will also increase the ataxia and muscular tension, and impair the progressive of muscles [8,9]. In the current study, a case of co-existing of odontoid subluxation syrignomyelia and vertebral artery abnormalities was reported. According to radiography images, remarkable odontoid subluxation syrignomyelia was identified and confirmed by surgery findings. Meanwhile, an obviously vertebral artery abnormity was uncovered. Considering these conditions, single posterior fossa decompression was not suitable owing to the increasing unstable of atlanto-occipital structure, which would not improve symptoms, but also could aggregate them. Meanwhile, even pedicle screws were utilized to reinforce the stability of atlanto-occipital structure after posterior fossa decompression, the odontoid was not able to restoration, and brainstem pression could not be alleviated. Therefore, combined with the posterior fossa decompression, the 1st and 2nd joints were fully debonding using rimer, and cages were inserted to promote the restoration of odontoid and alleviate pression of brainstem. Rahul et al. have reported a case of atlanto-axial subluxation with occipotal C2 fusion, and found that the fusion performed at occiput C2 level was enough to release the pressure of the cord, but not in C1-C2 levels . However, whether this idea is appropriate for patients suffered with vertebral artery abnormalities needs further investigation. In conclusion, co-existing of odontoid subluxation syrignomyelia and vertebral artery abnormalities is a rarely reported spinal related disease. The therapies for this disease needs further exploration, and bleeding may be an important risk factor and should be significantly considered. Samdani AF, Hwang SW, Singla A, Bennett JT, Ames RJ, Kimball JS. Outcomes of patients with syringomyelia undergoing spine deformity surgery: do large syrinxes behave differently than small? Spine J Off J N Am Spine Soc 2017. Shields CB, Zhang YP, Shields LB. Post-traumatic syringomyelia: CSF hydrodynamic changes following spinal cord injury are the driving force in the development of PTSM. Handbook Clin Neurol 2012; 109: 355-367. Suchomel P. Experts comment concerning grand rounds case entitled syringomyelia with irreducible atlantoaxial dislocation, basilar invagination and Chiari I malformation. Eur Spine J 2010; 19: 367-369. Hasegawa A, Yagi M, Takemitsu M, Machida M, Asazuma T, Ichimura S. Atlantoaxial subluxation after pyogenic spondylitis around the odontoid process. Case Rep Orthop 2015; 2015. Parke WW, Rothman RH, Brown MD. The pharyngovertebral veins: an anatomical rationale for Grisels syndrome. J Bone Joint Surg Am 1984; 66: 568-574. 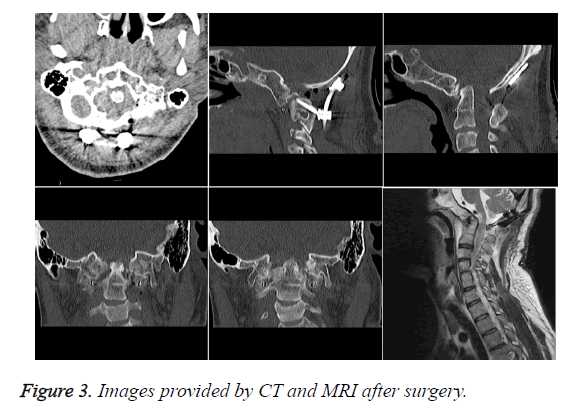 Ogata T, Morino T, Hino M, Miura H. Cervical myelopathy caused by atlantoaxial instability in a patient with an os odontoideum and total aplasia of the posterior arch of the atlas: a case report. J Med Case Rep 2012; 6: 1-6. Wu X, Ming L, Chang Y, Sun Z. Accidental or linked: separated odontoid process fused to the enlarged anterior arch of the atlas associated with atlantoaxial subluxation in a Kashin–Beck disease patient. Eur Spine J 2016; 1-5. Hatzantonis C, Muquit S, Nasto LA, Mehdian H. Congenital defects of C1 arches and odontoid process in a child with Downs syndrome: A case presentation. J Craniovertebr Junct Spine 2016; 7: 115-117. Dohzono S, Suzuki A, Koike T, Takahashi S, Yamada K, Yasuda H. Factors associated with retro-odontoid soft-tissue thickness in rheumatoid arthritis. J Neurosurg Spine 2016; 1. Kadam R, Bauva V, Shah K, Yadav S. Atlanto-axial subluxation with cervical myelopathy operated with occipital C2 fusion: A case report. J Med Res Innov 2017; 1: 4-7.